Ferns, desired by gardeners for their interesting foliage textures, come from a large group encompassing several genera, hundreds of species and hundreds more cultivars. One thing they all have in common is a unique method of reproducing by spores. 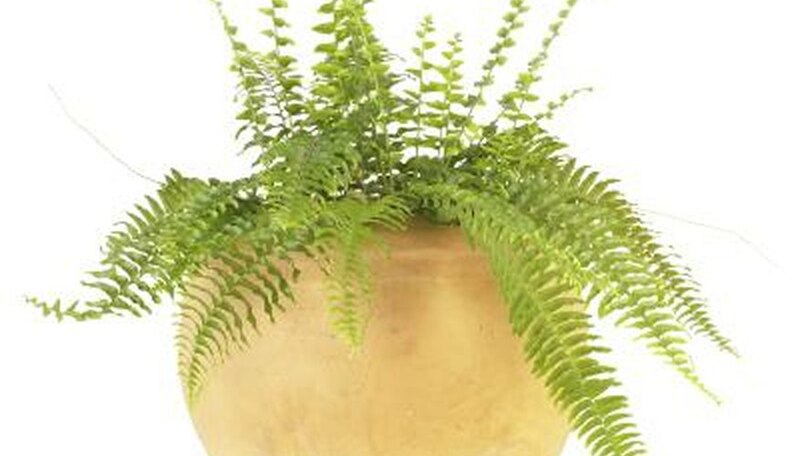 In addition, many ferns feature distinctive, gracefully drooping fronds, which add flair to any landscape or container. Hardy ferns tolerate cooler temperatures, whereas tropical ferns cannot. Whether your potted fern can survive outdoors in cold temperatures depends in large part on what type of fern you have and where you live. What constitutes "cooler" temperatures may vary depending on your particular climate. For example, a tropical fern might be able to stay outdoors year-round if you live in Florida and cold temperatures in your climate mean the low 60s Fahrenheit. In general, however, potted ferns that can live outside in cold temperatures usually fall into the hardy ferns category. Hardy ferns tolerate winter temperatures outdoors, according to Clemson Cooperative Extension, but many can also survive high heat. For this reason, hardy ferns are an excellent choice for year-round outdoor containers in most climates. The cold-hardiest ferns can tolerate winter temperatures in U.S. Department of Agriculture plant hardiness zone 3, and many of them grow in the temperate rain forests of the Pacific Northwest, Canada and Alaska. Hardy ferns can grow rather large -- up to 6 feet or more -- so choose a species and cultivar that will remain comfortably within the confines of its container. Containers should have drainage holes in the base, and you need to keep the soil continually moist. Most grow best in partial or full shade. The Northern maidenhair fern (Adiantum pedatum) is a low-growing, spreading fern that only grows to a maximum height of 3 feet, and although it does spread in the wild, the pot will keep it contained. Northern maidenhair thrives in USDA zones 3 through 8. If you want to add color to your container, try the Autumn fern (Dryopteris erythrosora), which changes from red to bronze and finally green as the growing season progresses. The autumn fern is hardy in USDA zones 5 through 9. Many ferns are native to subtropical and tropical climates. These can be grown in containers year-round in warm climates only and cannot survive cold temperatures. Home gardeners in cooler climates either bring the containers in for the winter, or grow the ferns indoors as houseplants. Indoor ferns grow best in indirect light, continually moist but well-draining soil and moderate temperatures. Although they like the warmth of the sun, they don't like the light: Most outdoor tropical and subtropical ferns also prefer shady conditions, along with rich, well-draining soil. Boston ferns (Nephrolepis spp.) may be some of the most popular ferns grown in warm climates and as houseplants. These plants rose to popularity during Victorian times and are often displayed in hanging baskets. Compact species, such as the sword fern (Nephrolepis exaltata), hardy in USDA zones 10 through 12, are best for pots. Staghorn ferns (Platycerium spp. ), with their unique fronds and growth habit -- they are epiphytic and can be mounted on bark or wood -- are another good choice. They can be grown in pots as long as you grown them in a planting medium made for epiphytic plants and not in soil. The common staghorn fern (Platycerium bifurcatum) is hardy outdoors in USDA zones 9 through 12.